Looking for an economical dinner to satisfy your hungry family? This tasty and filling casserole is just the thing! Makes a great breakfast too! 1. Brown the sausage in a large skillet, drain and crumble; return to skillet. Add hominy; stir until heated through, about 5 minutes. 2. In a large bowl, whisk together the eggs, milk, salt and pepper. 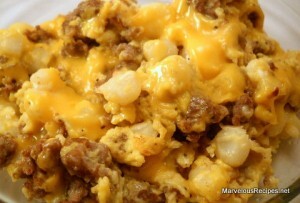 Stir into hominy mixture; cook until eggs are set, stirring frequently. 3. Pour into a 2-quart baking dish; top with cheese slices. Place under broiler until the cheese is melted. Makes 8 servings. I made something really similar to this a few weeks ago. It didn’t have the sausage. I like that addition. Thanks for the suggestion. I’ve never done a casserole with hominy before. If you give it a try, let me know how it turns out and how you and your family like it! It’s always good to try something new. I think the sausage adds a great flavor to this casserole. If you decide to try it please share your opinion with me.